Many people (this is not news) are over their heads with their mortgage and home's value. Their mortgage is considerably higher and in some case over 100% higher than their home's worth. Normally this would prevent you from refinancing your home. Long story short, there is an option that could save you lots and lots of cash each month. It's HARP 2.0 which is a program that allows borrowers to refinance regardless of how deeply underwater they are. 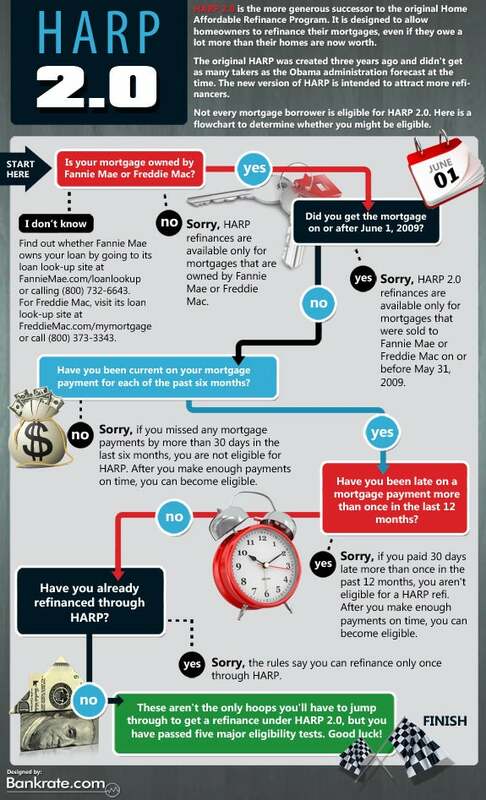 Here's a quick info-graphic to see if you qualify for HARP 2.0. Think of this as a pre-qualifier.